Today’s post addresses one of the seemingly most difficult grammar topics for most learners – the Portuguese Possessive Pronouns and Determiners. Ok, maybe you do not agree and you think tackling these is easy. However, a lot of my students make mistakes, mainly concerning the use of the article – o, a, os, as – before the pronoun/ determiner. See, the problem is that this is one of the divergence points between European Portuguese and Brazilian Portuguese, and it is important that those trying to learn the European variant have a clear idea of how to use the possessive pronouns and determiners properly. So, with no further ado, let’s dive into it! What are possessive pronouns and determiners? Put simply, these are words that we use to refer to things that are “possessed” or owned by someone. Imagine you own a car, and you want to refer to it to say its colour. You would use the possessive determiner “my”, as in “My car is black”. Portuguese also has these kind of little words. They are called Pronomes e Determinantes Possessivos. Without making it too linguistic and complex, determiners are used before the nouns, in connection with these. In the sentence O meu carro, we have the determiner – O meu – plus the noun – carro. Pronouns, on the other hand, come without the noun and they substitute it instead. They occur in sentences like – De quem é este carro? É meu!. In this case, the pronoun meu is substituting the noun carro. Therefore, it comes alone, unlike the determiners, and normally without the article. We understand the noun we are referring to, because it comes from context. To make it clearer: normally in English the determiner would be translated as “My” – as in the sentence “My car is black” -, while the pronoun would be translated as “Mine” – as in the sentence “Whose car is this? It is mine“. To sum up, when I want to say “My car is black” in European Portuguese, I will say O meu carro é preto. So the equivalent to “My”, in this case is O meu. If I want to say “The car is mine”, I will say O carro é meu. If you were paying attention so far, you have already found out that the English version of the possessive determiner has one word and the Portuguese two. This is because in European Portuguese, we are obliged to put the article – in the case above the word o – and the pronoun – meu – together when using a determiner. Be aware that this is the case for European Portuguese, not all variants of Portuguese. Take a look at the next section. 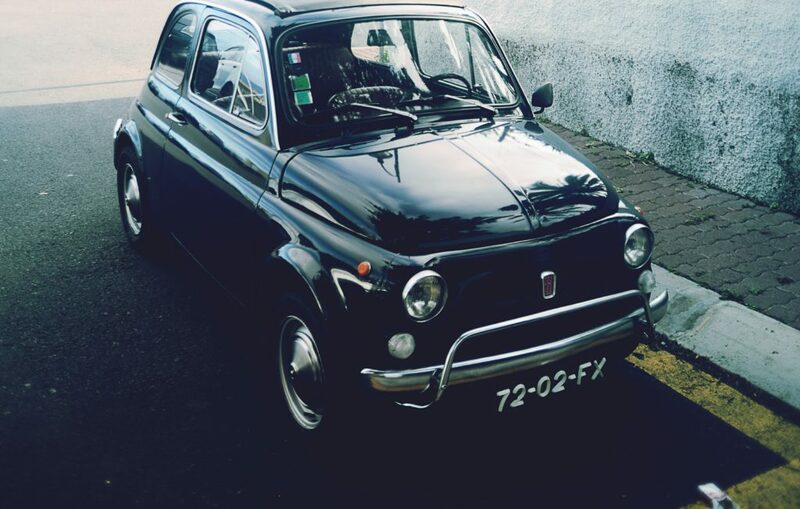 O meu carro é preto! In Brazilian Portuguese, when we want to say the same sentence – O meu carro é preto – we will not use the article. Therefore, Brazilian speakers use the sentence – Meu carro é preto. This means that the article – o, in this case – is left out. However, in European Portuguese, when using determiners, we always select the article that corresponds to the noun we are referring to. If the noun is masculine singular, we use o, like in the example. If the word is feminine singular, we use a. If the nouns are plural we use os or as, depending on whether they are masculine or feminine, respectively. So, if we were to translate word by word the sentence above – O meu carro é preto – we would end up with “The my car is black”. Obviously, we are not supposed to translate it literally, so do not get scared. I just want you to understand why and how we use the article. If we wanted to refer to a house, for example, we would say A minha casa é branca. This is because the word casa is feminine singular. If we wanted to refer to the cars, we would say Os meus carros são pretos, since carros is masculine plural. Furthermore, if we wanted to refer to more than one house, we would say As minhas casas são brancas, since casas is feminine plural. In Brazilian, somehow along the way, the article was lost. In Portugal, however, using the article in sentences like the ones above is imperative. Many of my students make the mistake to leave it out, but it is important to correct this if you want to sound more Portuguese than Brazilian. As you can see, for each person, there are four different pronouns and determiners, one for singular masculine, another for singular feminine, another for plural masculine and one for plural feminine nouns. Remember that these determiners and pronouns are always in accordance to the noun that follow or precedes them. However, since the third person singular – você, ele and ela – and the third person plural – eles and elas – have the same kind of pronouns, sometimes it might get confusing about exactly who we are talking about. If you focus on the words in bold, you see that we substituted the rows for the third person singular and plural. This means that if you want to say something like “His car is black” in Portuguese, you can either say O seu carro é preto or O carro dele é preto. The only difference between the two is that O seu is in accordance with the noun – so in this case with carro (masculine singular noun) and dele is in accordance with the person that owns the object – so in this case a male person – ele. This means that if the car belonged to a woman, we would have to either say O seu carro é preto (O seu referring to the car – masculine singular) or O carro dela é preto (dela referring to her – ela – thus feminine singular). The other difference between them is that the possessive determiners o seu/ a sua/ os seus/ as suas come before the noun, while dele/ dela/ deles/ delas come after. The pronoun forms both come in place of the noun. Before I go, I would like to give you some examples, to try and make things clearer, as I know that this is not so straight-forward as other things. O meu carro é azul. My car is blue. De quem é o carro? Teu ou dele? Whose car is it? Yours or his? A tua irmã é bonita. Your sister is beautiful. Essa camisa é minha. That shirt is mine. Os amigos dele são de confiança His friends are trustworthy. Os amigos dela são de confiança Her friends are trustworthy. A nossa amiga é simpática. Our friend is nice. Esta cadela é de quem? É nossa. Whose dog (female) is this? It´s ours. O vosso pai está bom? Is your (pl.) father well? Os cães deles são meigos. Their dogs are sweet. * As you can see it can be rather confusing, as it can mean a lot of different things that can only be clarified by context or by using the forms dele/ dela/ deles/ delas instead of these. If you arrived to this point, congratulations! I know it is not always easy to keep reading, especially if the path is so bumpy and difficult to overcome as the Portuguese Possessive Pronouns and Determiners may be. However, my advice is to not give up! If you are tired now and still did not fully understand the world of the possessives, maybe give it a rest and come back later to go over it again. When you do so, also try to solve the exercises below. They might further help you. Most of all, do not forget to have fun while learning Portuguese! __________ amiga chama-se Ana. My friend is called Ana. __________ carro é branco. My car is white. __________ mãe é alta. Your mother is tall. De quem são estes livros? São _______. Whose books are these? Hers. _________ planeta é bonito. Our planet is beautiful. Aquele casaco é __________. That jacket is his. Os sapatos ________ são velhos. Their shoes are old. A ______ família é simpática. Their family is nice. _________ irmãos são mais velhos? Are your (formal) siblings older? A casa ________ é velha. Her house is big. Find the pdf and the solutions here. You are doing a great job. I always enjoy reading your articles and learn more. It is very simple, interesting and easy to understand. Most of the time you try to cover the entire subject and it helps a lot. Muito Obrigada Mia. Thank you so much for your comment! It really makes me happy that my website can help people learn my beautiful language! It also feels good to hear that I’m doing a great job… it gives me confidence that I am taking the right track and it gives me strength to cotinue! Thank you so much once again!